Just as fast food restaurants try to generate excitement by coming up with new special burgers like the Baconator or the Spicy Southwest Chipotle Burger and whatnot, when you’re on the fifth installment of a horror franchise you have to find a way to spice things up a bit, but without deviating from the formula too much. 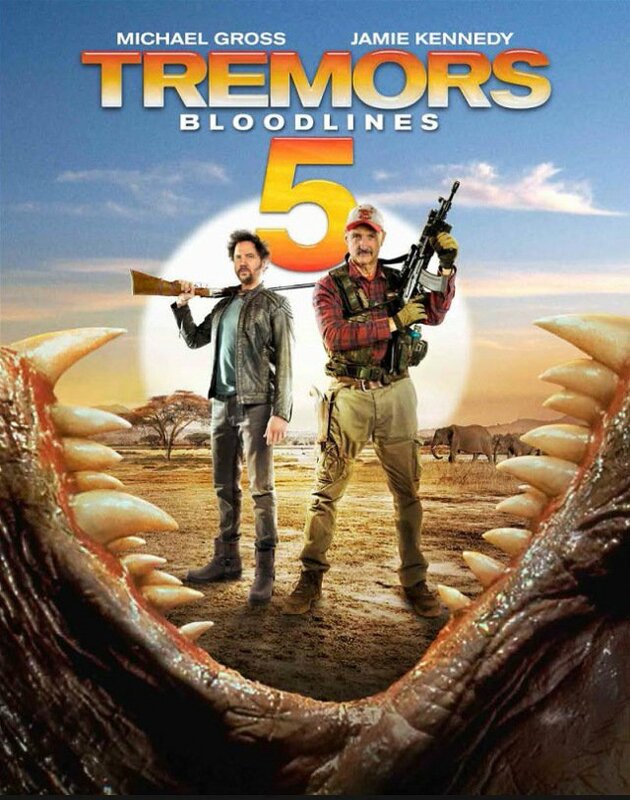 So consider TREMORS 5: BLOODLINES the South African Burger of the TREMORS franchise. Survivalist and monster hunter Burt Gummer (Michael Gross) is out shooting his latest home video when Travis (Jamie Kennedy) cons his way into becoming Gummer’s new cameraman. He’s just in time to be there when Erich Van Wyck (Daniel Janks) shows up to hire Gummer to come to South Africa, where there has been a confirmed sighting of an assblaster, one of the life stages of the giant monsters featured in the TREMORS series. Once at their destination, Burt complains about the lack of sufficient firepower while Travis tries to make time with local woman Lucia (Natalie Becker), mother of Amahle (Nolitha Zulu). Also the main cast is Dreyer (Brandon Auret), a local hunting guide, and Thaba (Sello Sebotsane), a flunkie who basically has monster food written all over him. From this set-up, things progress in predictable creature feature fashion, with various disposable characters getting eaten while the heroes slowly but surely figure out a plan to take out the monsters for good. Or at least until the next sequel. Director Don Michael Paul more or less specializes in cranking out B movie sequels of this kind, having already turned in installments of the SNIPER, JARHEAD, and LAKE PLACID franchises, as well as helming a Stephen Seagal movie. Nothing flashy, but the guy knows how to make an entertaining and professional looking film. It’s nothing to write home about, but if you’re in the mood for a fun monster movie, it’ll do the trick. 2 ½ out of 4 stars.